Criminal justice since 2015: What happened? What next? 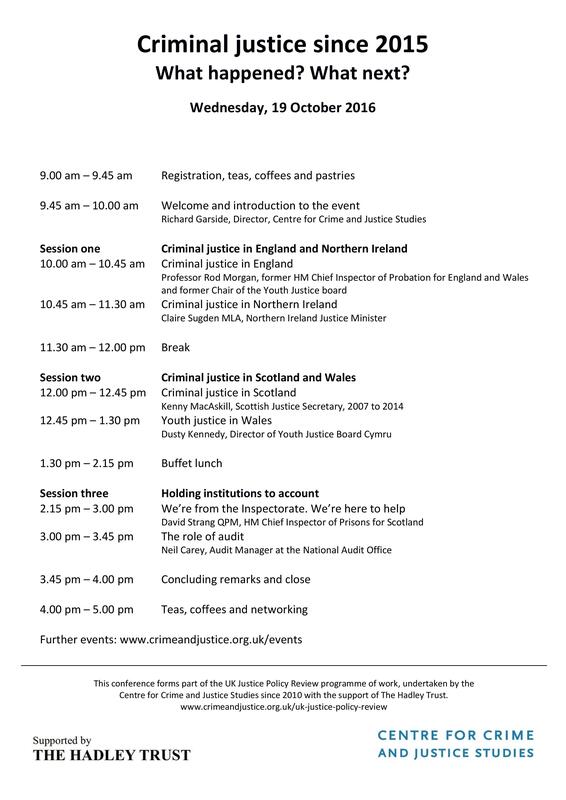 This conference will review criminal justice developments across the UK since the 2015 UK General Election, consider the implications of the 2016 regional assembly elections, and look ahead to emerging criminal justice challenges across the four UK regions. What's been happening in criminal justice across England, Wales, Scotland and Northern Ireland since the May 2015 General Election? Are there common patterns of criminal justice development across the UK's four nations and regions? Or has criminal justice policy been characterised more by difference and divergence, than similiarity and convergence? This conference will consider these, and other questions, with the aid of an expert panel of speakers and participants. As well as examining recent developments, the conference will also consider the future challenges facing the UK, Welsh and Scottish governments, and the Northern Ireland executive. The conference forms part of the Centre for Crime and Justice Studies' UK Justice Policy Review programme of activities. This conference features an impressive line-up of speakers, including former and serving ministers, senior policymakers and public servants. ​Download the full conference programme by clicking on the image. Now in its sixth year, each annual UK Justice Policy Review report combines analysis of the main developments in policing, courts, prisons, probation and other areas of criminal justice, with detailed data sections covering the main facts, figures and trends. Please help us and let your friends, colleagues and followers know about our page: Criminal justice since 2015: What happened? What next?